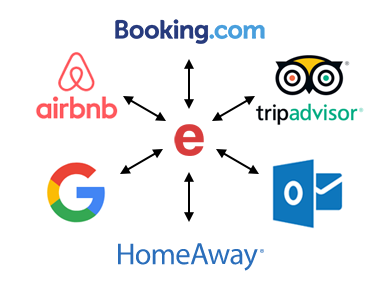 The easyReservations Premium Membership bundles twelve Modules with over thirty new, exclusive and extended functions for your website. Try out the demo now! With the payment gateways, invoices and excel export it’ll allow you to manage not only your reservations, but also your income and complete accounting in one system. For your guests your website will be much more interactive. They can search for available resources, edit their reservations afterwards and even communicate with the administrators in a chat. 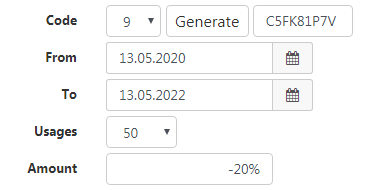 There's also a resource slider and the option to display the price calculation in the form. The HTML emails and its three very beautiful templates will increase the appeal of your business. 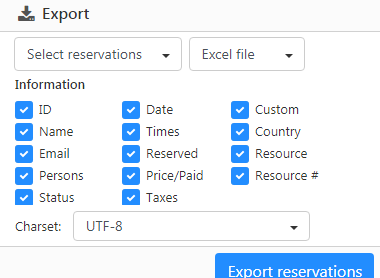 To reduce your work and increase the workflow you can let the reservations approve automatically after the user reserves or pays. For international websites forms, invoices and emails can have multilingual content. 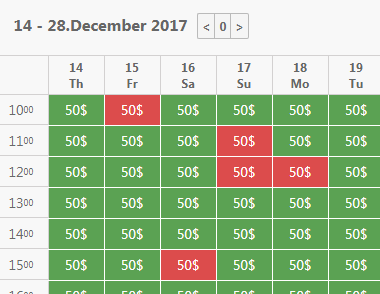 The calendar can show multiple months in a flexible grid and is also available in a hourly version. New Modules, Updates, and Support for one full year! New modules and updates to existing ones will come out regularly and are free for premium members. You can download and install them directly from your premium settings. While free members only have access to the bug-report forum, Premium Users have full access to every part of this website. You'll not only get help on how to set-up and use the plugin, but also fast support on problems. These services are available for one full year, but you’ll still be able to use the premium functions afterwards. Let your guests pay their reservations directly online. After payment the paid amount in easyReservatons gets updated and the reservation can be approved automatically. Also includes a deposit function and the option to let your guest pay later in the user control panel. 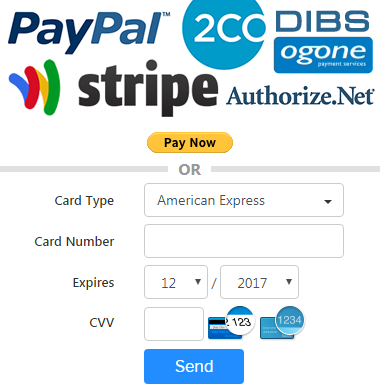 If you want to process payments manually there's also the option to ask for credit cards. New shortcode to let your guest search for available resources. As in the form you have complete control over the search bar to define what to search for. For the results choose to show the thumbnail, a description, the price, the amount of free spaces and much more. 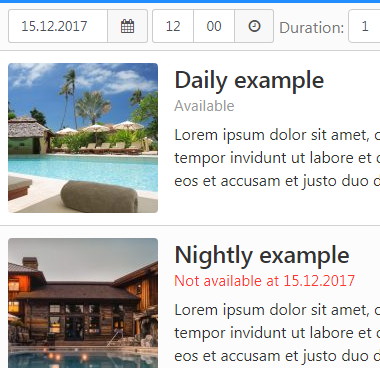 A highlight is the one-column calendar to display the availability directly underneath each resource. It can also be used to further refine the time selection. 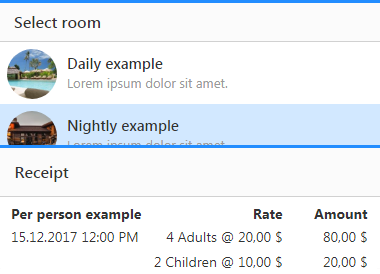 Together with displaying unavailable resources this helps your guests to know when each resource is available. Imports from .ics calendar feeds on an definable interval. By linking all of your calendars together and to easyReservations you'll have complete two-way synchronization. It's also important to improve the appearance of your booking process. The resource box allows your guests to select the right resource with more visual guidance. It can come as list or moder slider. The receipt shows the current form price calculation in detail. While it can be extensive you can also select which things to summarize to make it fit your product. 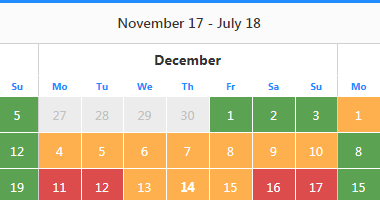 In addition it includes a new and cleaner datepicker style. With this module you'll be able to send beautiful emails to your customers. Three different email themes are included and it's easy to add your own. 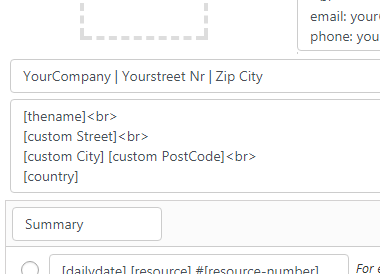 If your customers device can't display HTML email they'll automatically get the default text version. 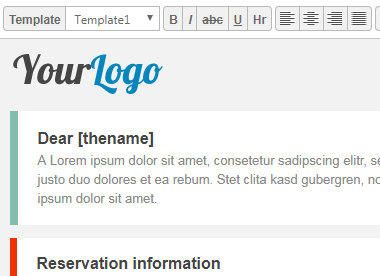 In addition there's an improved editor to setup the email templates. Of course it supports the multilingual module and the new emails types of the payment module. You can define how many days and hours to display. Like the calendar it's clickable and works together with the forms time and resource selection. In addition it's fully compatible with the extended calendar module to show multiple hourly calendars by grid. Now with half-hourly mode! 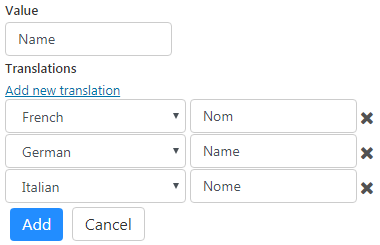 Adds a [lang] tag to enable multilingual content in your forms, invoices and email contents and subjects. Each sentence or word can have unlimited translations and it's very easy to setup. Translation can be done per sentence or for whole parts of content. 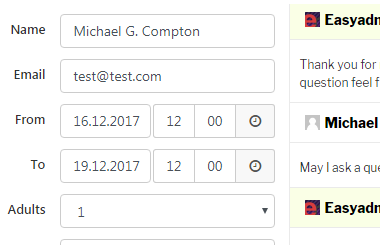 The translation works by the current language in frontend and if you can select it when sending out emails. 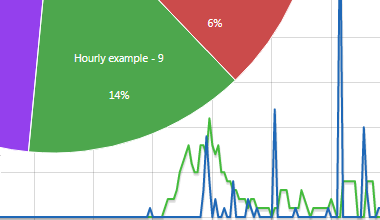 With this module you'll have access to a new statistic page. It contains bars of reservations divided by status, a graph of approved and new reservations, a pie that visualizes resources usage and income, detailed statistics over your reservations and a monthly comparison.